We are the first & small hostel in Ko Lanta with comfortable and affordable for all budget travelers. The hostel is well located at Long Beach (Phra-Ae), Ko Lanta. which restaurants and shops are surrounded. Less than five minutes walk to the famous Long Beach, Non La Mer is also close to an extensive array of shopping, dining and nightlife options. Our 44 beds in the property offering a pleasurable stay with extra large space dorm in 10 Beds A/C mixed dorm and 6 beds A/C mixed dorm. Ensuite bathroom every dorm and public bathroom for hot shower at 2nd floor. We are three friends who love to travel and run this hostel as we are backpacker as well. We are aware about privacy needed. So in each bed has Personal curtain, Locker with your own padlock, Reading light and Electric Socket. Our reception will be at 2nd floor whereby all guests could contact for motorbike rental, transfer, tours, and other information with friendly and reasonable price. Free toast – butter - jam from 7-10 am. Free WIFI , Free drinking water - please provided your own container to refill. Fridge, Cutlery set, Dishes, Microwave are in canteen area. Relax and watch HD movie for 24 hrs at 2nd floor. Just feel like stay home. You can ask to our crew for help you to turn on the movie in beginning. For who love Music, Dancing, Party Hopping, Games. This bar is a good choice. 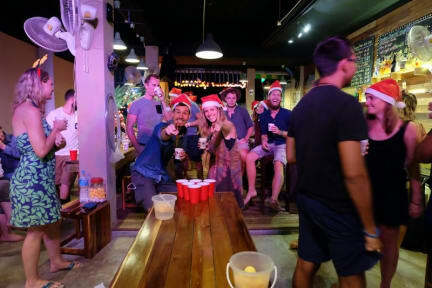 Get cheap Beer and Cold drinks from "Drunken Dude Bar " The hostel ground floor. " Have fun, party hard and sleep easy "
We are a green hostel. Let save our earth. Just a little thing you can help us.To save water in our lovely island. Our idea is to reduce water usage to cleaning cups and glass. So, Please bring you own container with you to refill drinking water. We provide cold drinking water & hot water for free in the dispenser at canteen area. Ottimo ostello, personale carinissimo, bella area comune, per il prezzo davvero non si può chiedere di più! Il plus e' che offrono tour e transfers a ottimi prezzi.